Apple is taking a welcome few days off over the Christmas period to regain its composure and try and work out its next move. Before that, the company released public – iOS 12.1.2 – and pre-release – iOS 12.1.3 beta 2 – firmware, which, as always, has allowed YouTube channel iAppleBytes to put a speed test together. It doesn’t seem unfair to suggest that Apple is slightly all over the place at the moment. We’ve had pre-release seeds issued that have skipped the first release. We’ve had public firmware released that breaks more than it fixes in terms of causing widespread cellular data issues and which has then been followed up with a version 2 of the same firmware. There are clearly a number of internal quality issues within the Apple ranks, which means that the average iPhone and iPad user is ultimately suffering. Apple will be looking to fix those problems internally but have any of the recent releases affected speed and performance? 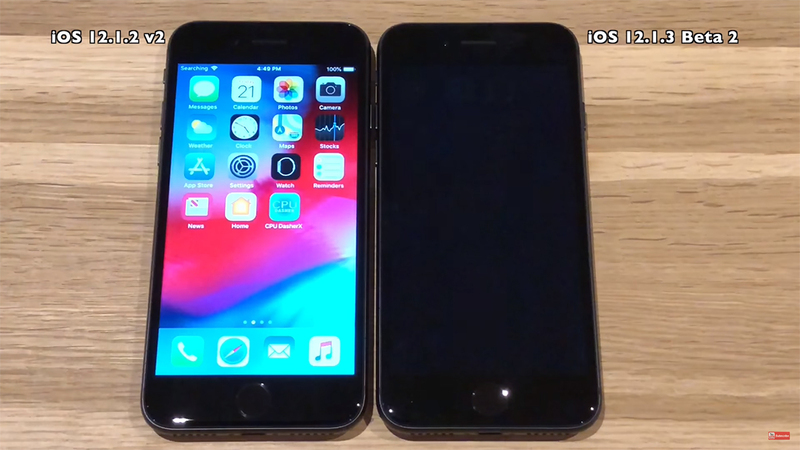 As always, the latest public and pre-release versions of iOS have been put head-to-head on an array of devices to see if the pre-release version – in this case, iOS 12.1.3 beta 2 – makes any notable performance improvements. Both firmware versions have been tested on iPhone 5s, iPhone 6, iPhone 6s, iPhone 7, and iPhone 8 to see if any improvements can be found. As expected, it seems that iOS 12.1.3 beta 2 performs in a pretty much identical fashion to the public iOS 12.1.2 version 2, build 16C104, taking into account expected margins of error. We really don’t know what the next step is for Apple. From a firmware perspective, we wouldn’t really expect any real-world improvements in terms of performance or battery life when transitioning from iOS 12.1.2 to iOS 12.1.3. This is a very small version increase and will wholly be focused on trying to fix bugs rather than putting any real engineering time or expertise into performance. In fact, as far as performance goes, given the maturity of the iOS 12 platform, we wouldn’t expect Apple to pay too much attention to these types of improvements until iOS 13 during 2019. However, the question really remains: what internal improvements is Apple going to make in regards to process to ensure that these buggy versions of iOS stop landing in the laps of the public?